Jupiter is 23 miles from Palm Beach and even farther away from Miami, so you must be really, really into baseball in order to make a pilgrimage. Jupiter is in the midst of a planned Florida community (the Abacoa Development), with all the good and bad that it entails — good for residents, who can be assured of the basic services they need as part of a larger development, but bad for tourists, who find that there’s usually not enough to keep their attention on a continued basis. You’re pretty much in the middle of nowhere in Jupiter, and you should plan accordingly. 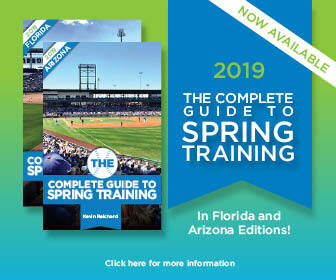 There are other spring-training venues within an easy driving distance. You could head 35 miles up the coast to Port St. Lucie (where the New York Mets train), over to West Palm Beach where the Houston Astros and Washington Nationals train at The Ballpark of the Palm Beaches or across the state to Fort Myers, where the Boston Red Sox and Minnesota Twins train. Where to Stay: A Courtyard by Marriott is across the street from the ballpark, but reserve early: it’s usually booked solid for spring training. (There’s ample parking around the stadium, but you’ll need to fork over more than a few bucks for the privilege.) Within two miles of Roger Dean Chevrolet Stadium are the Fairfield Inn and the Wellesley Inn; within 10 miles are the Best Western Palm Beach, the Hilton Singer Island, and the Doubletree. Flying In: The closest airport is Palm Beach International Airport, which is about 20 miles away from the Jupiter area. Most major airlines fly into PBI, including American, Delta, jetBlue, Southwest, United, and US Airways. You may also want to consider flying into Fort Lauderdale Airport or Miami International Airport and then driving to Jupiter if the fares are significantly cheaper. Miami International Airport is only 84 miles away from Roger Dean Chevrolet Stadium — and Fort Lauderdale Airport is even closer — so if you can save a few bucks for the price of a short drive, you should do so.